The striper bite is going well along with the rainbow trout and an occasional channel catfish. We have a visiting angler from the parker strip area. 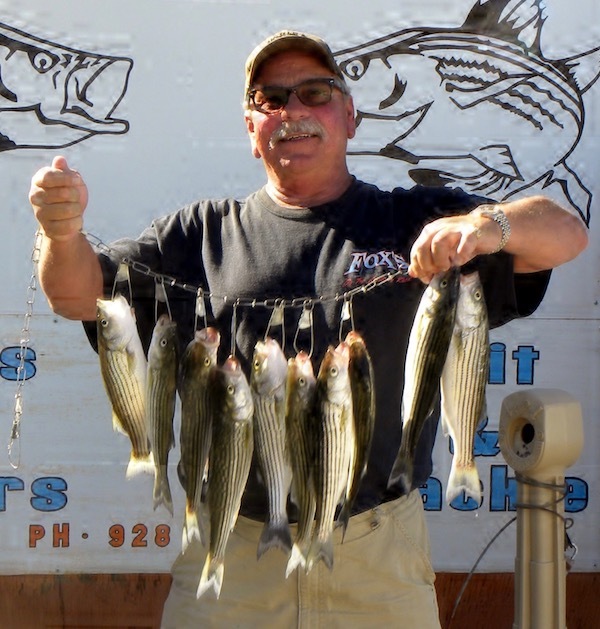 Tim Kilgore was fishing in the lower big bend area and was able to land a limit of stripers. He was fishing from a friends boat using anchovies. This is a great size as they filet out easy and leave a nice filet for my favorite dish fish tacos. There are a lot of different ways to prepare these fish and all are great as it’s a good eating fish. The rainbow trout are being stocked but a little more trouble to bring to the table. You will need to try various techniques to land these trout. It seems they need to get accustomed to the area before they start feeding. I have heard that power bait night crawlers are great for you bait anglers while various spinners are producing well. I like a panther martin in the yellow with red spots as an example but I am hearing that rooster tails were producing super.